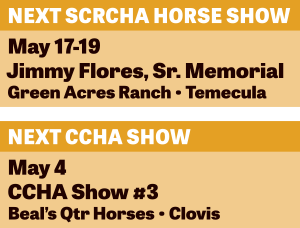 TEMECULA—The weather finally heated up in March, and the competition did, too, at the Southern California Reined Cow Horse Association Pot O Gold Show. There were some big classes and top open riders at the Pot O Gold, held March 15-18 at Casner’s Ranch. Herd work classes drew strong entries with the Open and Non Pro classes totaling 33 between them. Richard Winters, riding his A Spoonful Of Jonez, took first in the 19-horse Open with a 73, a point ahead of Roy Rich on the Rocking J Ranch’s Very Smart Luck (Very Smart Remedy x Gunna Be Lucky). Nicolas Barthelemy rode White Tail Ranch’s KK Sugar Twist to third place with a 71.5. Charles Stevens was a star in both Saturday and Sunday cow horse classes, riding a pair of horses owned by Erin Ellison to wins. 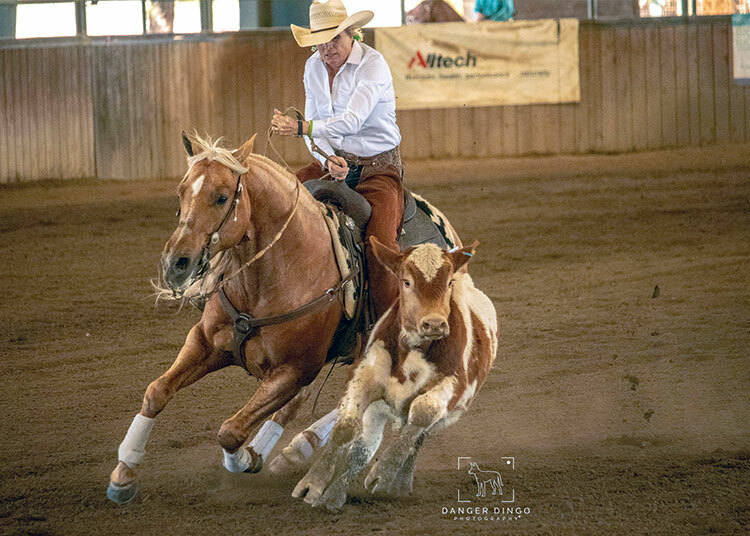 Aboard Smartest Hotshot (Smart Little Lena X Lean N Stylish), Stevens won the Open Bridle and Senior Working Cow Horse on Saturday, topping Doug Williamson on Rocking J Ranch’s Short And Smart (Smart Little Lena x Miss Shorty Paloma) in Saturday’s Open Bridle by a half-point with a 146. Devon Camilleri continued her hot start to 2019 with her Just Call Me Earl, winning the 12-entry $1,000 Non Pro Limited and Select Non Pro Limited classes on Sunday to go along with a reserve in the $5,000 Non Pro Limited class. Trainer Sunni McCormick enjoyed success on Just Call Me Earl, too, winning the Limited Open Hackamore both days. Her win Sunday came with a 142.5 score that gave her a 5.5-point cushion. McCormick also had a LImited Open Bridle win and reserve aboard Onetime Smarter, owned by Greg Bieker. Saturday’s Open boxing class had 32 entries, with Becky Holman coming out on top aboard Susan Carter’s Von Halo Nic—a half-point ahead of reserve Rick Hansen on Adam Crum’s CR Smooth Stuff.